There were multiple versions of the game released. Nintendo R&D1 developed the Famicom (NES), and Game Boy versions in 1992. There was also another version developed by BulletProof Software and published by Nintendo in 1994 for the Super NES. The game was released the following year in Europe. Yoshi's Cookie was also available on the Nintendo GameCube game Nintendo Puzzle Collection, featured along with Dr. Mario and Panel de Pon (aka Tetris Attack, Pokémon Puzzle League or Puzzle League overseas), which was only released in Japan, but was planned to come to the rest of the world at one time. The Super NES version of Yoshi's Cookie slightly changed Yoshi's appearance compared to his sprites in Super Mario World. The appearance in Cookie features a bigger head and shorter neck. This look was next seen in Super Mario World 2: Yoshi's Island and Yoshi's Story. The SNES version also reused some of the sprites (namely Mario's) and backgrounds from Super Mario World, as well as from Yoshi's Island, which was released after the SNES version of the game. The Game & Watch Gallery 3 released for the Game Boy Color in 2003, Yoshi's Cookie gets referenced. For the modern version of Egg, the game was redesigned to a Yoshi's Cookie look. 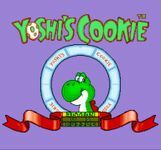 The NES version of Yoshi's Cookie was rereleased for the Wii's Virtual Console service on April 4, 2008 in Europe and Australia, and on April 7, 2008 in North America. The object of the game is for Mario to mix and match the cookies. The player controls a cursor which can be used to slide rows of a single "square" of individual cookies in a method similar to a Rubik's Cube. The objective is to create lines of matching cookies, which are then cleared off the screen (then eaten by a hungry Yoshi waiting in the bottom left corner). In adventure mode the objective is just to last as long as possible, while in puzzle mode the screen must be cleared in a minimum number of moves. Source: Wikipedia, "Yoshi's Cookie," available under the CC-BY-SA License.